Grab your spandex and pump up the hair band music for your 80s theme party. Both young and old party guests will enjoy reliving the neon decade with these ideas. What makes the 80s so appealing? Whether your guests were born in the 80s, grew up in the 80s or raised their own kids during the decade, they are likely to have strong feelings about it. The 80s were all about bright color, neon lights, leg warmers, hair bands, mullets and spandex. The icons of the decade lend themselves well to the party planning process, allowing you to decide which direction you want to go. It's easy to go over the top in all aspects of the party because that's what the decade was all about. The invitations, party décor and music set the stage for the party and get your guests excited about the event. Pac Man: Draw the Pac Man dots around the edge of black cardstock. Add cutouts of Pac Man and a few ghosts along the line. Write the details inside with a white or silver gel pen. Boom Box: Cut a piece of cardstock into a rectangle and decorate it like a boom box from the 80s. Neon Sunglasses: Use a permanent marker to write the party details onto a pair of neon, 80s-style sunglasses for a three-dimensional party invitation. Don't forget to add a note on the invitations requesting that the guests wear their favorite 80s clothing to the party. Neon colors bright enough to burn the retinas scream "80s". Use neon pink, green, orange or yellow throughout the party decorations, including the tableware. Animal print decorations offer an alternative 80s feel to the decorations. Posters of popular 80s musicians and movies from the decade will add a fitting decorative feel to the walls. Arrange toys and other items from the 80s on the tables. This might include Rubik's cubes, leg warmers, cassette tapes, boom boxes, Atari systems or a Trivial Pursuit game. An eclectic 80s soundtrack for the party sets the tone and encourages the guests to rock away the night. Big names from the 80s include Madonna, Michael Jackson and Cyndi Lauper. Don't forget the metal bands that embraced big hair and spandex. Poison, Bon Jovi, Guns N' Roses, Mötley Crüe and Warrant top the list in this genre. Throw in a few one-hit wonders such as "Whip It" and "Turning Japanese" to round out the musical selection at any 80s theme party. Every party needs entertainment. Carry the 80s theme to the party games and activities to add to the fun. Party games can keep the guests entertained while tying in the 80s theme. These ideas will have the guests on their feet and challenge their knowledge of the decade. 80s Trivia: Divide the guests into teams and ask them questions related to 80s pop culture. Name That Tune: Play clips of songs from the 80s, requiring the players to name the song or artist. 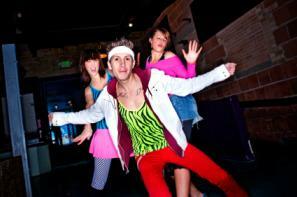 Dance Contest: Hold a dance competition, awarding prizes to the participants with the best 80s moves. Costume Contest: Judge the 80s costumes worn by the guests to determine the best dressed. For added fun, set up a stage area and let each contestant strut her stuff in her 80s garb. Rubik's Cube Competition: Gather several Rubik's cubes and invite willing participants to square off, with prizes for the first person to complete the puzzle. Karaoke is always a popular party option for guests of all ages. Stick with 80s music for the karaoke selections to keep with the party theme. If you don't have access to a karaoke machine, hold a lip sync contest instead. Another option is to play a favorite 80s movie at the party. If you'd rather not watch an entire movie, consider compiling your favorite clips from several movies for variety. The 80s provide a great deal of inspiration for the party planning process. Don't be afraid to go over the top with neon colors, big hair and rock music for your 80s theme party. An exaggerated use of the theme will leave your guests talking for months about one of the best parties of this decade.